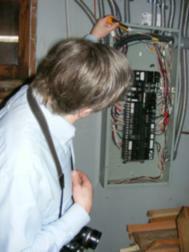 Seattle Home Inspector's Blog: Heat-alarm heart attack! The control and use of fire is what separates humans from the other beasts on the planet. When we lived in caves we had to figure out ways to keep smoke from killing us and when we moved into wood structures we had to figure out ways to prevent fire from burning the structures down and/or to allow us time to get out. This whole process has been quite a process and much of the building code is in place to address how to protect us from killing ourselves with fire. We have actually gotten pretty good at it. The instances of cows kicking over lanterns resulting in the destruction of whole cities seems remote today. Most of our worst nightmares with fire today are due to forest fires---caused by both man and nature. We have gotten so good at it, that many fire departments complain about a lack of real life situations to adequately train fire-fighters in how to fight fires. In modern residences one of the first lines of defense in saving lives from fire---after of course building the house and products in the house properly---is the modern smoke alarm/detector. As a Seattle Home Inspector I routinely find the many precursors to modern smoke alarm/detectors. Some of these early alarm systems were nothing more than wind up bells that would sound when internal components melted. Other systems were electronic---powered by batteries and/or house electricity. Most of the time these systems have been abandoned. On a recent inspection I found one such system beautifully intact and supposedly still functional---but who knows. This system had sensors located in every room and were designed to detect excessive temperatures---not smoke. A typical sensor is pictured above. The system itself had a control panel located in the Master Bedroom and would have made one hell of an alarm clock. I am sure that the thinking was that the parents would be the first to be notified of a problem and then they would alert the rest of the household. Of course if it was me I would likely have a heart attack and everyone would perish anyway. Currently, our modern smoke alarm/detectors have to be in all areas of the home so that everyone is alerted simultaneously---a good idea really. Even the modern ones can give a person a good startle---literally driving everyone out of the house. Thanks for the quick historical overview of our fire protection systems. How do you feel about sprinkler systems for homes ? My parents are building and I just found out it's current code here to have an alarm in every bedroom. Of course it's my parents and I would have wanted it that way. Sounds like some of the old systems might have alerted the neighbors after the occupants had died of smoke inhalation anyway. We had heat alarms in our house growing up. They were hung on the wall in all or most of the rooms but I do not remember any control panel. They had a very loud ring. Not as piercing as smoke alarms but I remember it being much louder. One got dropped a time or two when we were painting and went off. Oh my gosh yes, that could cause you to have a heart attack and not be able to wake the rest of the household, but what a fun find! Nor, I am not sure you want to get me going on residential fire suppression systems. How can we avoid them? I think it is only a matter of time before they are required in all new construction. When it comes to fire how much is a life worth? Hard to argue against them for that reason. That said the number of deaths related to house fires is very small. In multi-family structures they certainly make sense. In residential properties they may be more about saving property than lives. It is a murky place to go to argue against them----because as I said before---what is a human life worth? Tammy yes---and has been that way for quite a while now. Maureen I think the type you are talking about was not a "wired" type---simple heat alarm. Here is a picture of one such wind-up device. I love that old device. I would buy it if I saw it for sale. Neat. That one Charles looks like something out of the 1950's. WILD. Thoroughly enjoyed your tutorial on the evolution of fire alarm systems and I always like the different systems and/or situations you find in your inspections! Sheila, I am sure these fall in the world of "collectibles"
I'm told there is still a scathe although I can't see it directly. Only when the mirrors are right. Those dang "chirps" drive me crazy. I can handle the ones on an 8,9 foot ceiling but did the builder have to install one in the top of the cathedral ceiling in my bedroom???? Now that is very cool looking. What a great focal point in the master bedroom no less! Like you, I would have a heart attack if that went off while I was sleeping... LOL. Charles, I've never seen one with the heat sensors before. The modern day ones are called smoke detectors for a reason. Thanks for the history lesson. Charles, that is one serious fire alarm. Mercy! I've put a thousand in the homes my company wires, and It's one of those items we exceed code on every time. After doing a fire restoration project years ago I can't allow myself to meet code minimums. Thanks fo the post. The band I was in played "Lark's Tongue in Aspect" at a high-school talent show, at that time "Funk" was the most popular, several bands played "Brick House" The director of the talent show came up to us afterward and said what was that- Star Wars! So yes my Crimson blood runs deep ; ) I will pick a new genre to barb you with. By the way it was a fun article to read, love that kind of stuff. That's cool. The idea of being able to re-power it by winding it up is like those emergency radios with a hand crank. No batteries to run down. Of course you have to remember to wind it up in the first place. Charles, I loved hearing the history of smoke alarms! WOW! Love the looks of that thing...how old do you figure it is? Great post! Maureen, was it more like this one? Lenn, I know what you mean---sometimes when I am inspecting one of those "bankowned" houses I get to hear one chirp the whole inspection---they can be hard to locate too :) To answer your question---yes---required in the bedroom. Andrea, it would be hard to go to sleep just knowing the dang thing might go off and scare you half to death---but alas---perhaps no worse than a smoke detector going off. Janice, the house was 1960---probably installed then. CHARLES, I remember way back when a person selling fire alarm systems came calling. He sat us all down, kids too, and went through the scariest selling speech about fires and how we needed to buy this system. We, naturally, had to buy it since kids were screaming and crying from fear. It was activated by heat, if I remember correctly, and stayed in the house forever. From time to time now in my real estate career, I still see these relics. Good blog. Here's the picture of one of the antiques I blogged about. Barbara, that is an equally cool picture---I remember seeing it on your blog. Maureen---this one was given to me by a buyer after they purchased the house---and have it in my box of fun things to show students. It is a fairly common one. Very cool, Thanks for sharing your photos. I am pretty sure you are mixed up and that device is actually a blood pressure monitor. Charles, every home I have ever owned has an alarm system that incorporates hardwired smoke, heat and carbon monoxide detectors. If I somehow sleep through the siren, the alarm company will notify the fire and police department. There are way too many horror stories of families with young children perishing needlessly. The person who installed that now antiquated system must have cared for their family very much as it was state of the art then. That thing looks huge . . . Your post reminds me of a story. Years ago I used to work for a family who owned skilled nursing facilities, and adult board and cares. And I'm not kidding . . . one of the owners told me they DISCONNECTED the fire alarms in one of their facilities because . . . and I'm not kidding . . . when it rained water leaked into the panel, and caused the alarms to go off. Rather than fixing the leak, they just disconnected the alarm system. I stopped working for them a short time later. They were motivated by evil. What a great historical referecne! Thank you for sharing it with all of us. Ray, most newer homes are wired this way---one goes off they all go off. Thanks for the nice reminder about fire safety. I'm going to check all our smoke detectors when I got off my laptop. We don't do that nearly enough. Other than the kitchen one that goes off every once in a while when I'm cooking... lol. I have seen a more than a few historic fire alarms over the years, but one in such pritine condition, never. Charles -- What good would one of these be anyway? If they went off when they sensed extreme heat or their components started to melt, how would that save a person who was exposed to the same extreme heat? That contraption is very official looking, though. Wow! I bet that alarm is sure loud when it goes off! Alarms freak me out! Chalres, and getting startled is a great thing in these situations. Maybe someday, these objects will be considered art. Now that's my kind of alarm clock. Never seen one in a house like that Charles. Things are changing and smoke alarms are not the exception of it. According to the National Fire Protection Association (NFPA), there were more than 358,500 home fires per year from 2011-2015, so it is quite important to have your smoke alarms functional.